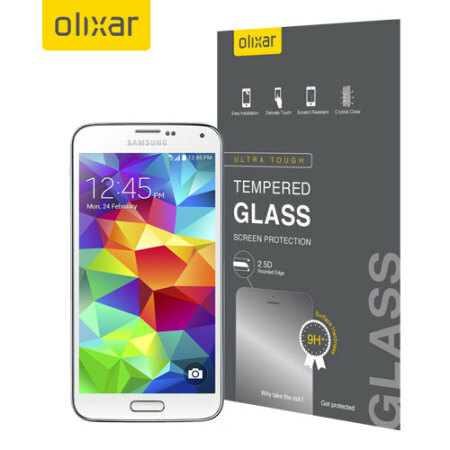 This ultra-thin tempered glass screen protector for the Samsung Galaxy S5 from Olixar offers toughness, high visibility and sensitivity all in one package. Much better than my plastic screen protector. No bubbles or gouge marks. Nicely made leather effect case with slots for credit cards etc. Disappointed with the magnetic fastening strap. It is very weak. Arrived from overseas very quickly. Easy to apply, recommend to anyone. Great fit. Goes right to the edges unlike other screen protectors I've had. And very thin. The Samsung Galaxy S5 Screen protectors that I ordered from MobileZap were exactly as described in the advert and they came in very solid protective cases that protected them in transit. The items came quickly and I definately recommend the seller. Best protector I've had. Recommend. Bought two tempered glass screen protectors for Galaxy J3 and S5 and both are great. They fit virtually right to the edges of the screens unlike previous protectors we've had and are significantly thinner. Easy to order and arrived quickly. The protector was simple to fit, left no bubbles, the screen is still as reactive and it does not appear to gather too many fingerprints. Good choice from my point of view. Easy application. Took only 1 minute to prep the phone and apply the screen. Now my phone is protected! Great bit of kit that so many overlook! Have used Olixar for years now with each new phone. This was a replacement as I was careless enough to drop my current phone. But, the pane of glass did it's job - it cracked and the phone's screen stayed intact - bargain at 15 quid and bought through mobile fun means I can rely on service and delivery to be top notch. So simple to apply this screen protector, it is unbelievable! Previous protector (different brand) was cracked but had protected the phone screen from the same fate so had to have another - best money I have ever spent on my phone. If you value your mobile and it's screen, get one of these!! So implementation to apply this screen protector, it is unbelievable! Previous protector (different brand) was cracked but had protected the phone screen from the same fate so had to have another - best money I have ever spent on my phone. If you value your mobile and it's screen, get one of these!! I bought this as it is 100% better than the plastic film ones fits very well and fairly easy to apply, a bit expensive but will protect and last. Good screen protector fits well easy to apply smudge less and tuff. Great Product. Good Price. Nuf Said. My first purchase from MobileZap. Product is great. Price is reasonable. Took a while to come from UK but that's as expected. No complaints at all. Would recommend based on this first experience. I'm thrilled to bits with my screen protector. Once it was lined up it was easy to put on. No air bubbles to clear.It is slim but very protective. Whether I use my thumbs or the stylus pen, the slightest touch is all that's needed. I would recommend this screen. Dissapointed with this product, fits ok but there are impurities in the glass that showed up when fitted. Very happy with Mobile Zaps service as i have bought accesories off them before. I have bought an S5 tempered glass screen off them before but a different brand which was a quality product. I wont be buying the Olixar tempered screen cover again as the quality just isnt great. I opened it up and it was all packaged very nicely. I looked at the install video on the website and it looked very easy, just wipe down with a wet wipe and then use the microfibre cloth. In the packet there was a wet wipe, dry wipe and a microfibre cloth plus a few stickers. The dry cloth was numbered so that was pretty self explanatory but the stickers? they ended up in the bin. I followed the instructions and it fit perfectly, no bubbles and no problems. Great fit, really thin but tough glass. Does not affect the screen touch in any way. Super thin glass, perfect fit. Purchasing of product on your website was easy and product received within a reasonable time. Am very happy with the product . Was well packaged with clear instructions and cheaper than I could buy locally. Was also out of stock at a local supplier, so has been a win win all round. Would not hesitate in buying again. I quite like this glass, it's easy to fit and no bubble troubles - would rate it amongst the best. Ok - this is the second one of these that I've bought... first one fitted really easily just dropped straight on. Donated phone to hubbie a year later and had dropped the phone in the meantime so although the screen was perfect still (dink in side of phone - oops) the top corner had lifted slightly so thought I'd treat him to a new one of these. Messed up with first attempt as a speck of dust had got caught - thought it would be a nightmare to remove but just gently levered the semi stuck screen up, used blue sticky sheet included to remove dust from screen & sticky side of protector & dropped back on - you'd never know it was the second attempt at fitting!! My son researched this item and was very impressed with the reviews. He told me it could stop a bullet but I wouldn't like to put that to the test. Easy to fit and looks top quality. Have been told by my son to give it 5 stars. Screen protector is ultra thin and simple to fit. Smoother surface than factory screen! Phone is just as responsive as before. Case also very slim profile and a good, secure fit. Although the corners seem to be well protected, the top and bottom edges of the phone look a bit too exposed. Apart from that, both seem to be A1 quality and good value. This is a must for any phone, It's easy peasy to fit, all you need is a steady hand. The case I bought is for a Samsung S5 and I own an S5 Neo they are supposed to be the exact same size according to all the reviews but the case I got is a TINY bit big as in, It's not snug. It still looks good I am very happy with It. I am very impressed with my items, I was worried about attaching the tempered glass but following the easy instructions I had no problem what so ever. Nothing fancy. It does the job. It's a nice product. I don't tend to drop my phones but if I do I expect this case will protect it satisfactorily. Very happy with this screen protector. I have tempered glass screen protectors on other devices and I would say the Olixar one is better than them. Very clear to look through and the coating ensures fingerprints are kept to a minimum. It came with clear application instructions and I found it easy to apply. I have knocked off a star because of the excessive packaging. I do understand that tempered glass needs to be packaged well, so that they don't break in transit, but this Olixar model had excessive plastic packaging. All of which ends up in landfill after you've applied the screen protector to the phone. Sorry to hear you are not happy with this item. We can only hope that the screen protector was working as it should and took an impact without it damaging your actual phone screen. Excellent service delivered on time. Tempered glass screen protector is of good quality for protect the mobile screen. This is a great product as wife hates plastic screen protectors. purchased cover for Samsung Galaxy 5. Clear description of product. Was a little difficult to place without touching the glue side & inevitably I put my fingers under the top edges. If I was being picky the slightly less than clear areas are annoying, but in reality I never notice it unless I try to! Also spent time trying to remove a non-existent protective cover after fitting! Dont pick at it like I did, there isnt one - generic instructions apparently ! When I pointed this out to MobileFun they kindly sent a replacement. Very good strong case with a nice tight fit well worth the money & looks good on showing the colour of the phone. Having tried "screen protectors" on other phones, I was loathe to fix one to the Galaxy. I defy anyone to stick a flimsy plastic protector on without getting bubbles and dust bumps. This product is completely different. It applied to a clean screen (cleaning materials included) with ease, no bubbles etc., and is now part of the phone. The surface is as touch sensitive as the uncovered screen and it adds no noticeable thickness. An added bonus is, being glass, it is easily cleaned with a buff from a duster without resorting to expensive screen cleaners. The best addition to my phone in the past year - highly recommended. The result is great and especially the feel when using the phone. It was a little tricky to apply esp vs some covets that you apply with a lotion, wet application ones allow you to refine the positioning, this is tricky as the protector is rigid and you have to lay it down perfectly orientated. It could do with the front protective plain having some tabs to hold while you apply the product. Once on its great but not as perfect a fit to the whole screen edge to edge as other plastic ones I've used,as I use a chunky case it doesn't matter, but you would notice it a lot if you use your phone naked. So far it has resisted my keys a few times, so great on the protective and use. A genuine high quality product at an affordable price. It's a little more fiddly to install than we are first led to believe and the instructions aren't a great help but with common sense it is fairly easily manageable and it looks great without spoiling the look or weight of the phone. Certainly better than the wrap around I had before. It's neater if you don't use the button extender and actually reduces the liklehood of accidental contact. Just purchased a new Samsung Galaxy S5 and wanted to make sure I protected it. When I was putting it on, all was fine until I got to the top left corner, it just wouldn't ( and hasn't ) stuck to the glass. It's really annoying. I tried and tried, using a little plastic device to push out the air and get it to deal. No luck. Very frustrating. You can't really tell when using it, but you can definitely see it when in sleep mode. I was very careful not to touch it, so it is a pain. In saying that, the actual protector itself seems to be very good quality. You can mostly take your chance with the supposed deals across the Internet, but this case is actual class, especially for the price! amazing product and excellent service! I can really recommend this product. High quality just as described and really easy to put on the screen unlike the thinner plastic type screen protectors. I'm very clumsy so drop my phone a lot, this screen protector has not shown any weak points after being put to the test. Definitely worth the money! Crisp clear display has not been affected at all by this product. Excellent customer service and received the item in good time. Don't hesitate folks! Just buy it. Always use Martin Fields screen protectors so when I got my first new phone for in a few years it was straight to mobile fun for a MR protector. Great fit and price as always. I bought this because of the reviews I had read on here and because I have had good experiences of purchasing from Mobile Fun previously. But it has been a total waste of money for me as I am not impressed with this product and the finished result on my phone. The instructions hardly make sense, with missing words etc so it's off to a good start! There is a tab to peel off the protective layer once you are ready to apply and this is where it started to go wrong. The tab is very thin and weak, too weak to be up to the job of holding the layer in order to peel it off. It ripped off the layer immediately, which left nothing in place to hold onto and prevent finger marks on the adhesive side. The tab is placed right where the front facing camera is once in situ and this has resulted in the glass screen not being able to stick in this area, which will affect the front camera. The glass screen is a few mm smaller than my phone screen, which it obviously needs to be, but this is a big enough visual difference to have to be very careful in lining it up. great product does exactly what its surposed to with no loss of colour. This screen protector is extremely easy to apply and it has a premium feel to it when compared with other screen protectors. You can't even really tell when it's on and it doesn't affect the quality or brightness of the picture at all. However, just a few days after having applied it, the protector started randomly cracking in my pocket - without any trauma to the device itself. It was only a small crack so I decided to ignore it for another day or two, until I woke up from one sleep with yet another crack on the protector. The cracks got worse and worse and now there's no use to it whatsoever. This product is great for your phone. Easy to adhere and a great protection for the face. It also gives your touch screen a quicker response. Applies very easily, does not impair touch screen, easy to clean, very good protection. The quality of this screen protector is very good and I'm sure it will protect my phone's screen very well. Application went well. There were a few small bubbles but pressing on them got rid of them, due the silicon on the underside of the screen protector. In this respect, this fares a lot better than traditional screen protectors where it is much hards to get rid of bubbles. I will definitely buy one of these again when I need a new screen protector. I ordered this product after a friend of mine had tried and teseted it. It does exactly what it says it will do! Very good service, arrived before the estimated date. Easy application and very happy! Being transparent you don't even notice is there, easy to handle you phone with it. Looks great! I regretted not getting a screen cover for my Galaxy S3. So I decided I was definitely going to protect my S5's screen and went for one of these. IMHO <£13 is a small price to pay to preserve the screen of an S5! It's extremely easy to apply and it's quite exciting to put it in place and then tap the centre and see the adhesive stick from the middle of the phone's screen to the outer edges. In the box you get a good kit with cleaning products to prepare your screen's surface and some little nubbins for the home button in case you want it to stay proud of the protector. Personally, I like how with the protector applied, the home button now lies ever so slightly recessed. It means the home button isn't pressed accidentally so much when I'm getting the phone in/out of my pocket. The phone's screen is just as responsive with the protector applied as it is without it. Overall, very pleased with my choice. The only improvement that I would like to see on future revisions would be to round the edges of the protector down to where they meet the screen, which I've this morning seen on another product. However, with the "Muvit miniGEL Case for Samsung Galaxy S5 - Black" also applied to my phone, the edges of the screen protector are tucked neatly into the inner edge of this. These two items make a great combo! the kit comes with cleaning wipe, cloth and a sticky pad to clean before applying.very easy to fit with no air trapped at all . does not affect viewing that you can notice.i give it a 4 star as the glass is everso slightly smaller than the screen but this will be covered with the case edging. also the rubber stick on home buttons you get went straight in the bin. not needed and a terrible fit! overall for the money so long as it lasts well seems to be a good buy .